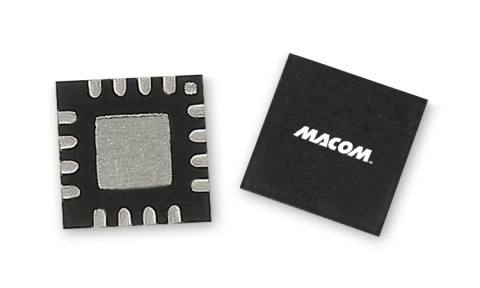 MACOM Introduces New Negative Voltage Drivers Optimized for Use With High-Performance AlGaAs and HMIC PIN Diode Switches | MACOM Technology Solutions Holdings, Inc.
LOWELL, Mass.--(BUSINESS WIRE)--Dec. 18, 2018-- MACOM Technology Solutions Inc. (“MACOM”), a leading supplier of semiconductor solutions, today announced two new negative voltage drivers designed for use with a broad range of MACOM’s AlGaAs and HMIC PIN diode switches. The new MADR-011020 and MADR-011022 drivers enable integration that complements the industry-leading performance of MACOM’s advanced PIN diodes, providing designers with layout-efficient and cost-effective solutions while eliminating the design complexities and time to market constraints imposed by discrete componentry. The MADR-011020 enables back bias voltage selection between -20V and -50V and provides up to 50 mA sinking and sourcing bias current for medium power SPDT switches, while the MADR-011022 accommodates between -10V and -25V with up to 25 mA sinking bias current and 20 mA sourcing for use with low power SPDT switches. These compact 4mm, 16-lead PQFN packaged drivers feature built-in power sequencers, eliminating the need for external power sequencing, and can be easily controlled with standard TTL logic. Achievable switching speeds range from sub-50ns (MADR-011020) to sub-80ns (MADR-011022). These drivers can be used as building blocks where two or more drivers can be paralleled to control 2 to 8 throw switch configurations. An all-off RF switch state can be achieved using the drivers’ enable pins. MACOM is a complete solution provider for High Performance RF control components, providing discrete PIN diodes with I-layer thickness from 1 micron to 400 microns for frequency-specific switching and power limiting applications, discrete chip capacitors and quartz chip inductors for custom bias networks/filters, drop in wideband (2 to 18 GHz) bias decoupling networks for use with discrete or integrated switching circuits, multi-throw switches using MACOM’s HMIC or AlGaAs technologies with on-chip biasing networks, and TTL-compatible positive and negative voltage switch/PIN diode drivers with very fast switching speed. MACOM offers standard band-specific control circuits, and supports customers with devices for custom designs and circuits. MACOM’s new MADR-011020 and MADR-011022 drivers are available to customers today. For assistance identifying MACOM products optimized to substitute or replace offerings from other vendors, visit MACOM’s Cross Reference tool. For more information about these new drivers, please visit. Any express or implied statements in MACOM product announcements are not meant as warranties or warrantable specifications of any kind. The only warranty MACOM may offer with respect to any product sale is one contained in a written purchase agreement between MACOM and the purchaser concerning such sale and signed by a duly authorized MACOM employee, or, to the extent MACOM's purchase order acknowledgment so indicates, the limited warranty contained in MACOM's standard Terms and Conditions for Quotation of Sale, a copy of which may be found at: http://www.macom.com/partner-login.